On a spring day in 1947, Mr. Rickey, the powerful General Manager of the Brooklyn Dodgers, summons heavyweight champion Joe Louis, tap star Bill ‘Bojangles’ Robinson and actor Paul Robeson to his hotel room in Manhattan. Rickey wants their support when he taps Jackie Robinson to be the Major League’s first black ballplayer. But a power struggle ensues when the eloquent Robeson raises questions about Rickey’s motivations to integrate white baseball. 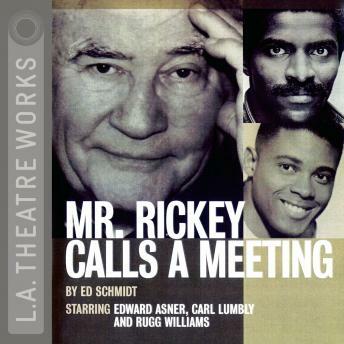 An L.A. Theatre Works full-cast performance featuring Edward Asner, David Downing, Tommy Hicks, Carl Lumbly, Sterling Macer, Charlie Robinson and Rugg Williams.